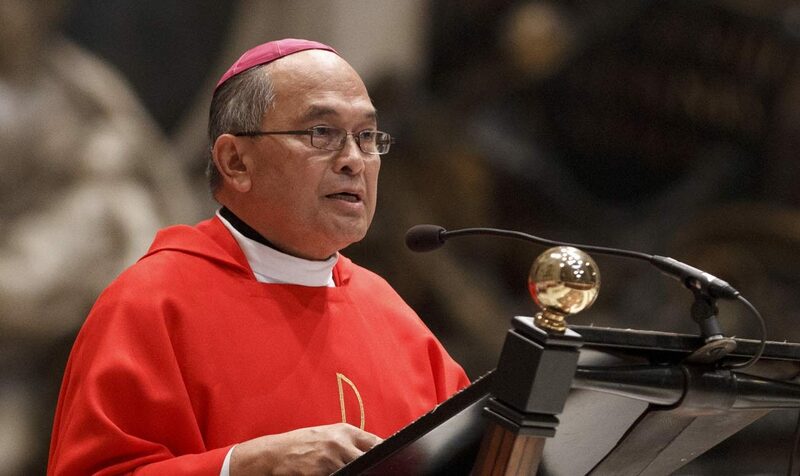 VATICAN CITY (CNS) — Cardinal Raymond L. Burke, a church law expert and former head of the Vatican’s highest court, arrived in Guam Feb. 15 as the presiding judge in a church trial investigating allegations of sexual abuse leveled against Archbishop Anthony S. Apuron of Agana. The Vatican press office confirmed a “tribunal of the first instance” was constituted by the Vatican Oct. 5 and its presiding judge is Cardinal Burke. Four other judges, all of whom are bishops, also were appointed, the press office said. “When an action is in a ‘first instance’ court, that indicates that it is in the initial trial phase,” according to the website of the Congregation for the Doctrine of the Faith, which handles accusations of clerical sexual abuse. Three men have publicly accused Archbishop Apuron of sexually abusing them when they were altar boys in the 1970s. The mother of a fourth man, now deceased, also accused the archbishop of abusing her son. Archbishop Apuron has refused to resign, but in late October, Pope Francis named former Detroit Auxiliary Bishop Michael J. Byrnes as coadjutor archbishop of Agana and gave him full authority to lead the archdiocese. At a news briefing Feb. 10, according to Pacific Daily News, Archbishop Byrnes announced the archdiocese would adopt the U.S. Conference of Catholic Bishops’ Charter for the Protection of Children and Young People. Accusations of clerical sexual abuse involving minors automatically would be reported to civil authorities, he said. Also at the briefing, the archbishop confirmed that Vatican investigators would visit Guam, but he provided no further information. This actually might be a good fit for Cardinal Burke’s skill set and temperament, presiding over clergy abuse trials. The Knights of Matla position did not work out very well.